It looks like 44 states allow some form of open carry—and Texas isn’t one of them. I recently read P.J. O’Rourke’s Parliament of Whores, and in it he makes the point that we rarely thank our elected officials for what is in fact an often thankless job. I just listened to a public hearing of the Texas Senate’s Agriculture, Rural Affairs & Homeland Security Committee. The hearing began at 9 AM. I woke up about 11:30 AM and started listening at about noon after leisurely making breakfast. The hearing continued until 5:36 PM. Most of the legislators appear1 to have left by 3 or so, but the chairman, Senator Craig Estes, remained to the end. So, Senator Craig Estes, thank you very much. You did a great job. Most of the people at the hearing were in favor of joining the majority of states that allow open carry. Some of the Senators are still arguing the last war: they’re using the same arguments used against concealed carry, that it’s going to result in more arguments escalating to murder, that people are not going to be able to trust their neighbor if they think their neighbor might be carrying, and what will the children think? All of the failed arguments against concealed carry, without regard to the fact that none of these things happen in other states that allow concealed—or open—carry. Julie argues against open carry because it might be a trigger: according to her, 8% to 9% of the United States has some form of violence-induced Post-Traumatic Stress Syndrome. That is, almost 10% of the population might be set off just by seeing a firearm! And if it’s military PTSD, it could even cause more violence! Thus, even though concealed carry did not result in a bloodbath as was predicted by opponents, open carry still can. If one out of eleven people were triggered just by seeing an armed police officer, or any of the DPS troopers providing security for the capitol, this wouldn’t need to be a theory. We’d be seeing the results daily, and it wouldn’t be pretty. Four out of every hundred people would be cowering and sobbing every time a law enforcement agent walked by, and another four out of every hundred would go into a killing frenzy. It would be a pitiable bloodbath. And I can’t imagine what’s going on in the forty-four states that allow open carry. And, finally, she added, if open carry is enacted, people with PTSD might start avoiding Texas, hurting our economy. That one I can understand: it explains a lot if everyone who is stressed out by firearms is concentrated in places like Washington, DC. One of the more interesting arguments in favor of open carry came from women at the hearing: they would like to be able to carry even when they’re wearing clothing that can’t fully conceal a handgun. Men will wear anything, but most women’s clothing isn’t designed to conceal bulky objects. I didn’t want to have to limit my clothes shopping to only clothing that could carry concealed. April 8: Updated names now that the video is available online. I say “appear”, but really it’s “sounds like”. I lost video around 1 PM and had only audio afterward. This of course depends on how “open carry” is defined, however, the other states that don’t allow open carry are California, Florida, South Carolina, Illinois, and New York. And, of course, Washington DC doesn’t allow it either. This is most likely Julie Gavran. She identified herself as a Ph.d. student who is not in the field of Psychology; if this is the same person, she “is a PhD candidate in the School of Arts and Humanities at the University of Texas at Dallas where she is researching the life and work of Benton MacKaye, the founder of the Appalachian Trail.”, which is in fact “not psychology”. She is also the social media coordinator for the anti-self defense organization Students for Gun-Free Schools as well as the regional coordinator for the Campaign to Keep Guns Off Campus. She didn’t identify herself as either of those, either. This was Colin Owen, Chief of Police for Milano. You can see his testimony at 7:46 PM. 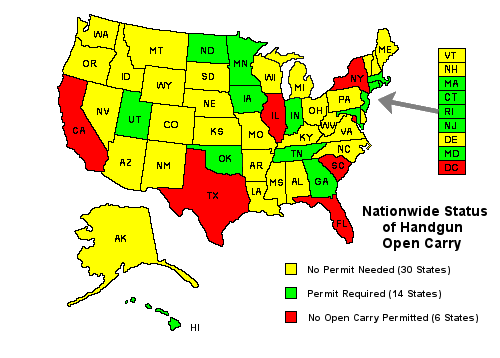 Several maps showing the state of open carry laws in the United States. Parliament of Whores is perhaps the best introduction to Washington, DC politics that I’ve seen. And it’s funny as hell to boot. The central web site for Senator Craig Estes; from here you can get to his Facebook posts, his blog, and his tweets. “Archived audio and video recordings of Senate Chamber proceedings, Senate Committee hearings, and other archived events…” The video you’re looking for is from 4/7/14, from the Senate Committee on Agriculture, Rural Affairs & Homeland Security. Texas open carry Senate hearing last modified October 31st, 2014.